Back in the Olympics thread and another thread where there was a wave of posts trying brainstorm ideas around the Charlesgate. My hopes have been with the right ramps with the railyand combined with ramps around the Charlesgate, we can make Storrow Drive from Charles MGH to BU Bridge redundant. F-Line crushed every Charlesgate idea with fundamental flaws until he probably got tired but a few more were thought up afterwards trying to address it. Is there idea can be brought up to them that are actually realistic combining both areas? While this thread probably should be what they are going to occuse in this meeting. It would be nice if we can keep brainstorming and ideally find a realistic idea that meets the objectives that we can advocate. This project is going to take 4 years? That seems a bit long for what they're going to do. It's crazy that they're able to do something like the Fast 14 a couple years back and completely rebuild overpasses over the course of a weekend. But it takes 5 plus years to add a lane to 128/95/93. That project is moving at a glacial pace right now. Fast 14 works because they shut the bridge down for a weekend, demo the old structure, load the new structure on a big truck, and slide it into place. Only really works for a specific kind of bridge. They aren't just rebuilding overpasses here, they're building a mile of new mainline freeway both at grade and on a replacement viaduct, in addition to many miles of new ramp and several new arterial alignments and intersections, all while the existing freeway and ramp system (which is decidedly in their way) continues to operate. 4 years seems reasonable for that. As to the other ideas, ours tended to be more on the pie-in-the-sky side, but if davem wants to repost his map (his concept became the unified one for all of us) that would be wonderful. 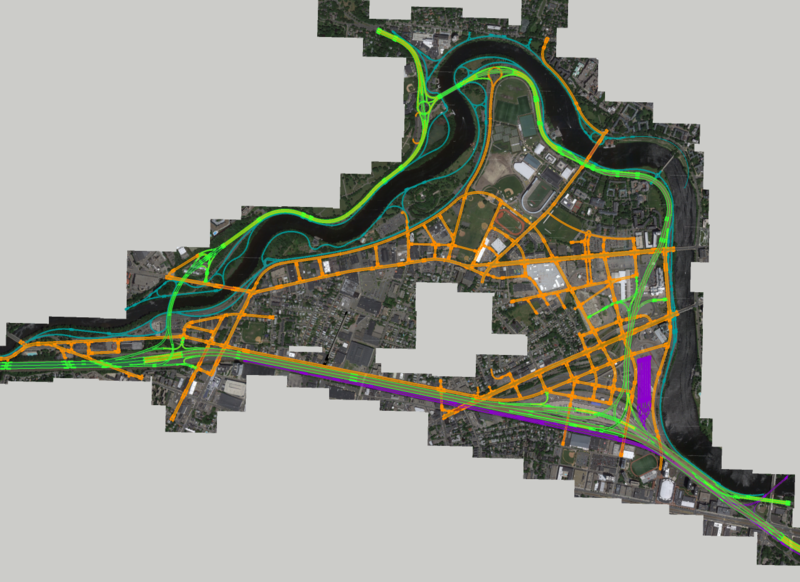 The general idea was that the conceptual designs proposed by MassDOT are lovely examples of good highway engineering, but cut the site up with high speed ramps and gave little attention to building a contiguous area for new development or connecting neighborhoods across roads. MassDOT also does not in any form address the awful intersection between Cambridge St. and Soldiers Field Road (yes, I know that's DCR's problem, but they should have been in the loop). 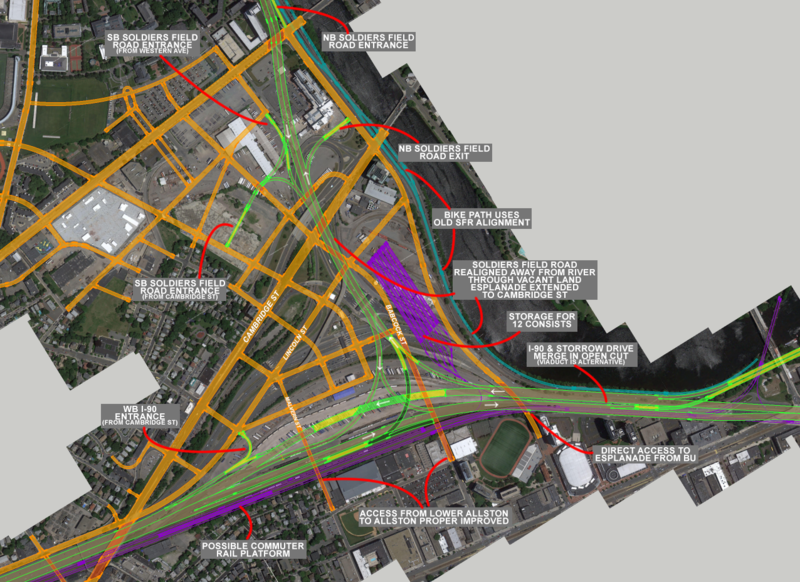 Bottom line: This interchange needs to be reduced in scope far more than MassDOT has proposed. Otherwise, you get something equally disruptive and ugly as what we have now, just with a DPW yard in the middle of it instead of a toll plaza. Last edited by Equilibria; 04-02-2014 at 08:51 AM. ^This is all dreaming of course. The part below is what counts. Here is the section that's going to be rebuilt. I annotated it quickly, I'll try to do a higher resolution version in the next day or two. Suggestions? I wasn't going to go to the meeting, but I can if there will be a few of us. If need be, I can run off a presentation board or two of this. I was considering it, but it's a PITA to get there from my house. On the other hand, it's the best opportunity there is to influence the course of this thing, so it certainly seems worth it. A presentation board would be a cool thing to bring (though with the necessary caveat that this is meant as a "what could be in a perfect world" vision, not as a realistic alternative to MassDOT's concepts). Seriously, why the heck aren't you a traffic engineer? That annotated image is presentation-quality. Show MassDOT that board, talk about your ideas and why they are as such and I wouldn't be surprised if they handed you an offer letter, even just to do graphics for them. Last edited by datadyne007; 04-02-2014 at 01:50 PM. Does the I-90 and Storrow split include left hand ramps in the inbound side, or am I not reading that diagram correctly? Don't think of it as a left-hand ramp so much as an even split - it preserves the current SFR/Storrow connection without forcing you to traverse 4 lanes of traffic. There would be tight striping pattern (for exit-only) between the entrance and the exit, right Dave? DaveM, your design is fantastic. Solves so many issues, and makes so many real improvements. If the connection between the Pike and SFR road was buried, this would be perfect. It would be simple enough to do a cut and cover tunnel, and definitely in Harvard's interest, meaning, they would be incentivized to pay some of the additional cost, grant the easements, etc. Seriously, why aren't you in charge? Only awkward thing I spot is that getting on EB Pike requires going over to the SB SFR entrance ramp. Not that I mind this. If that's the only "awkward-ish" thing, it's practically perfect. You already have to go to just about that spot. The only difference is that you have to make a left off cambridge instead of that highspeed merge to the right that currently exists. I didn't want to put an onramp closer because it would either a) require a left hand ramp onto thr EB pike, or b) would dangerously reduce the amount of weaving space on SB SFR before the split. I think the plan looks pretty good for the most. Some issues I see are for those going from Storrow west bound and merging onto the Pike westbound with those already traveling on the Pike westbound exiting to get on Storrow west bound. The same goes for those in the opposite direction. Traveling on the Pike east bound to Storrow east bound dealing with those coming from Storrow east bound trying to get on the Pike east bound. That's easily solved by eliminating Storrow Drive. People talk about "eliminating Storrow Drive," when they don't realize how essential it is for people traveling in and out of Boston North of the City. What needs to be done, if anything, is a paving and a huge roundabout where Storrow, and Memorial Drive meet with Buckingham, Brown and Nichols.